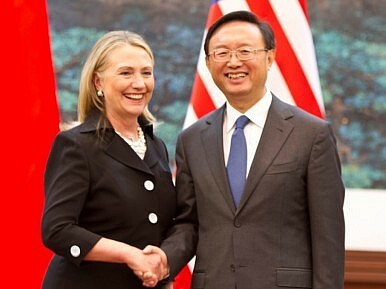 Then-U.S. Secretary of State Hillary Rodham Clinton and then-Chinese Foreign Minister Yang Jiechi (September 5, 2012). Chinese leaders got to know Clinton well when she was secretary of state — and didn’t much like what they saw. As expected, Vermont Senator Bernie Sanders scored an easy win over former Secretary of State Hillary Clinton in the New Hampshire primary voting for the Democratic Party’s presidential nominee. While most of the attention focused on Donald Trump’s massive victory in the Republican Party primary, Sander’s win – or, more accurately, Clinton’s defeat – might be cause for celebration in an unlikely place: Zhongnanhai. Beijing would never make public its preference for a U.S. presidential candidate. But in China, Clinton is well-known — and not particularly popular. That, in turn, could hamper a hypothetical President Clinton’s efforts to work with Chinese leader Xi Jinping, who values interpersonal relationships in diplomatic efforts (see, for example, his noted warmth toward Russian President Vladimir Putin — and reputed dislike for North Korean leader Kim Jong-un). Clinton has a long history with China, dating back to her time as First Lady. In 1995, Clinton gave a rousing speech on human rights in Beijing at the UN World Conference on Women, in which she declared that “women’s rights are human rights.” Fourteen years later, when she assumed office as secretary of state, Clinton was proud enough of this moment to specifically list it in her official State Department biography, but the incident left a lasting negative impression on China, which keenly resented being embarrassed on the world stage. When Clinton became secretary of state in 2009, China was likely somewhat mollified by an early remark that seemed to suggest she would not, in fact, emphasize human rights. During her first trip to Asia as secretary, Clinton told reporters that U.S. pressure on human rights issues “can’t interfere with the global economic crisis, the global climate change crisis, and the security crisis” — a remark her critics took to mean she would turn a blind eye to rights violations in exchange for Chinese cooperation elsewhere. Later, in a 2011 interview with Jeffrey Goldberg of The Atlantic, Clinton spoke harshly of China’s “deplorable” human rights record, calling the government’s efforts to crack down on dissent “a fool’s errand.” In October of the same year, in a Foreign Policy article outlining U.S. Asia strategy, Clinton listed “advancing democracy and human rights” as one of the “six key lines of action.” To Chinese leaders, who are on constant watch against U.S. attempt to foster “color revolution” by drumming up human rights issues, Clinton’s remarks were ominous indications of hostile intent. But it’s not only her stance on human rights that irked China. Clinton was seen as the point person on the rebalance strategy. Her 2011 Foreign Policy article, “America’s Pacific Century” largely laid out of the contours of the rebalance, and her extensive travel in and personal attention to the Asia-Pacific made her the strategy’s public face. Yet Beijing finds the rebalance inherently threatening, believing it is a thinly-veiled gambit to ‘contain’ China. Thus Clinton, the supposed architect of the rebalance, is viewed with deep suspicion in Beijing. Clinton’s vocal stance on the South China Sea led many Chinese analysts I’ve spoken with to conclude that she — not Obama — was the mastermind behind U.S. “interference” in this realm. Her remarks also set a precedent for the South China Sea being raised at each and every ASEAN meeting – a change China abhors (it has repeatedly stated ASEAN forums are not the proper venue for raising the disputes). Generally, though, China isn’t too bothered by tough election rhetoric. Its analysts remain confident that candidates will change their tune once voted into office – and historically, that’s been the case. The ‘tough-on-China’ rhetoric favored by Ronald Reagan, Bill Clinton, and George W. Bush eventually succumbed to geopolitical realities. But in Clinton, China sees a politician who is demonstrably devoted to furthering a campaign to “contain” China. China knows exactly what it’s going to get with a Clinton presidency – and it doesn’t like the prospect. So don’t be surprised if there are more than a few closet Sanders supporters within the halls of Zhongnanhai. US-China Talks in Washington Were Another Missed Opportunity on the South China SeaWeathering the Coming Storm in the South China SeaRegional Security Stakes In Southeast AsiaThe Potential Pitfalls of US-Vietnam RapprochementChina and Russia Pose Different Problems for the US. They Need Different Solutions.